I have a confession to make - I LOVE Iceberg lettuce! If I hear one more person dissing my Iceberg telling me it has "no nutritional value", I'll... I'll get really mad. Nutrition be damned! To me Iceberg lettuce is a comfort food. 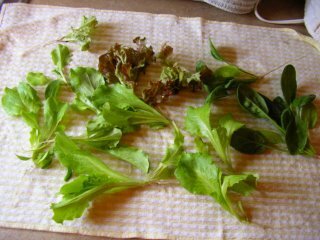 Growing up, if you didn't raise lettuce in your garden (and let's just say Mother wasn't exactly into gardens), then if you wanted a salad, you ate Iceberg lettuce. Aunt Della had a HUGE garden, but she didn't waste precious space and effort on growing lettuces. Potatoes, carrots, onions, beets and the like were grown because she could put them up when harvest time came. Even though she was old by the time I came along, she still maintened her canning garden. Needless to say, until I grew up and started gardening for myself, the only lettuce I ever ate was Iceberg. I do love the beautiful lettuces I grow now. Even their names are so cool: Oakleaf, Black-seeded Simpson, Red Fire. They make such a pretty and tasty salad. Using Iceberg as the base, of course. I absolutely agree with your iceberg lettuce comments Sally. The other complaint about iceberg is that it has no taste, only texture. Well, what's wrong with that? They say the Chinese appreciate the texture of food, and have far more words for it than the rest of us. When you want crisp texture in your salad, nothing else will quite do. Oh,Thank You, O.F. I knew I wasn't the only iceberg junkie out there! LOL As for taste - I think it DOES have a distinct flavor, especially closer to the heart. 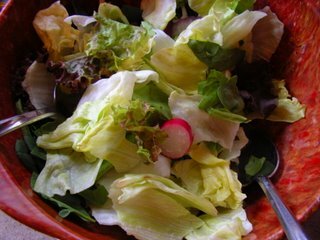 And it holds up well to the dressing and other additions to the salad bowl, such as tomatoes, radishes, onions, etc. To me it's the "building block" (so to speak) of a really great salad.